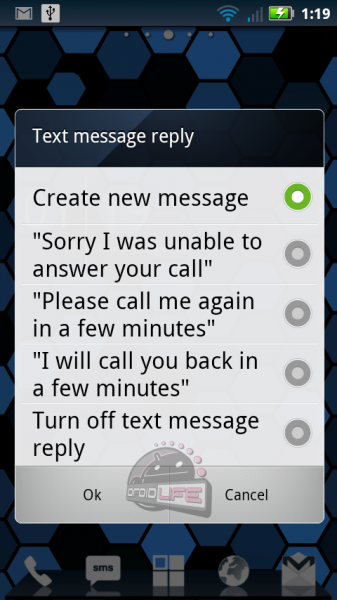 With the new MotoBlur that comes over top of the leaked Gingerbread (Android 2.3) that we’ve been talking non-stop about for days, there is this nifty little feature that allows you to ignore incoming calls and then quickly reply to them via text message. As you can see from the screenshot above, this is the pop-up I received immediately after hitting ignore to a call that just came through. There are some stock messages already built in, but it also allows you to create your own quick hitter which is a bonus. You can also turn it off completely if you’d like. Any other tips like this that you guys have stumbled across?